"God’s Song of Faith Brings Light"
ICE DRAGON: LEGEND OF THE BLUE DAISIES is an animated fantasy about a young, spirited girl and her grandfather, who try to show people in their village the truth of the blue daisies and their song, created by God, which turn darkness into light and keep an evil dragon at bay. A Christian allegory, ICE DRAGON is fairly well made with fun characters, songs and an engaging story with a strong Christian worldview of good triumphing over evil, but caution is advised for younger children for the scary villains. ICE DRAGON: LEGEND OF THE BLUE DAISIES is an animated fantasy adventure about the young and spirited Melody and her grandfather Nicholai. They teach others about the blue daisies that grow around their house-sanctuary, and the magical song that causes them to grow. This song was a gift from the Great Giver of Gifts and has the power to change hearts and turn darkness into light. As long as people believe in the song, the daisies will grow and the evil being that lurks beneath the earth will be unable to rise. This being, whose name is Dracon, was once the most beautiful and powerful Guardian of the song. However, he became proud and wanted to use the song to strengthen his own power. The Guardian Michael fought him and banished him into the depths of the earth, but not before he transformed into a giant dragon. For years people sang the song and were grateful to the Creator for His protection, but over the years belief in the song waned and eventually was regarded as nothing more than a folk tale. As that belief waned, so did the blue daisies. For Nicholai and Melody, however, the song is very real and alive. They seek to teach others about it, but that only brings about ridicule from their neighbors. Things start to look up when Melody makes friends with Leif and his dog, Hunter. He doesn’t believe in the song yet, but there’s something about Melody he just can’t ignore. The daisies are disappearing, though, and the dragon wakes from his underground den. Bursting from the mountain, he comes to take the town with his minions, two frightening wolf creatures. Now, Melody and Nikolai’s message that there’s more to life than meets the eye doesn’t seem so foolish, but the people don’t know how to fight this scary dragon foe. Melody, Nicholai and Leif work together against the dragon, but only faith and the protection of the Creator can save them now. ICE DRAGON: LEGEND OF THE BLUE DAISIES is clearly a Christian allegory. The movie has a style that takes some time to appreciate, but it has an interesting storyline, sweet characters and upbeat songs. 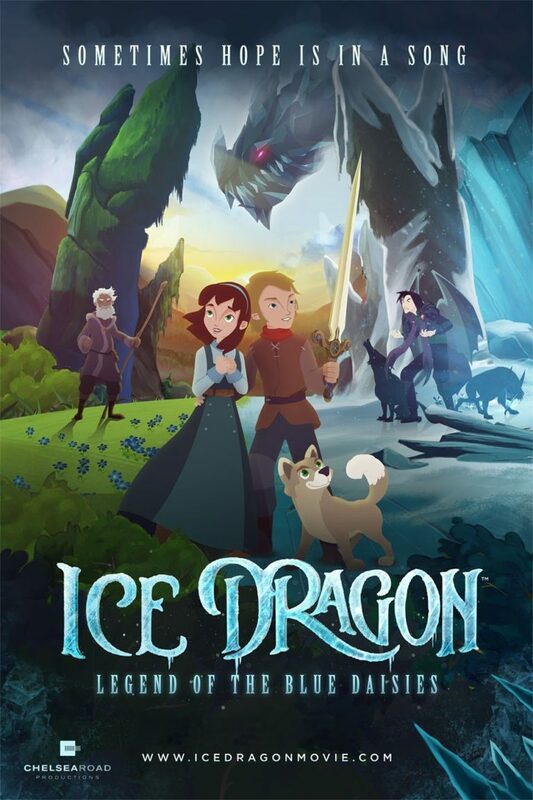 Thus, ICE DRAGON is an animated fantasy that parents can enjoy along with their children. Some viewers may not appreciate the magical way faith is portrayed, or the movie’s potentially controversial eschatological views. Ultimately, however, ICE DRAGON has a strong Christian message of good triumphing over evil and shows the importance of sharing your faith. The story also beautifully shows that God and His power protects those who love Him. Some villagers are mean to an old man (this is shown as bad), and Melody lies at one point to tease someone. There is also a comment that makes faith seem illogical, but that notion is then contradicted. ICE DRAGON will appear on local movie screens through one-day screenings starting March 24, and 26, 2018. Due to some potentially frightening scenes of the wolf creatures, and people fighting the dragon, caution is advised for very young children. However, media-wise families and moviegoers will enjoy seeing a very wholesome animated fantasy adventure for a change instead of the kind of violent fantasies Hollywood often produces. The movie is reportedly part of a planned three-movie trilogy. Light miscellaneous content includes boy takes a roll without asking, girl lies as a tease, people pressure man to give up his faith, faith is shown allegorically in a magical way, pixie dust magic is mentioned, and one comment makes faith sound illogical but is then contradicted. ICE DRAGON: LEGEND OF THE BLUE DAISIES is an animated fantasy about Melody, a spirited young girl who lives with her grandfather, Nicholai. Nicholai teaches the young children about the blue daisies and the song of hope that helps them grow. The song can turn darkness into light. It also keeps an evil dragon at bay. As long as people sing the song, the dragon can’t touch them. However, belief in the song wanes, and the dragon is freed. Only faith, and the protection of the Creator, can save the people now. A Christian allegory, ICE DRAGON is a fun movie for children that adults can also enjoy. Its style may take some time appreciating, but it has interesting characters and songs, and it shows the power of God and His protection over His people. The movie’s eschatological worldview and magical elements may be controversial to some viewers, but ICE DRAGON shows good conquering evil and promotes the importance of sharing your faith. Due to some potentially scary scenes of people fighting a dragon and scary wolf creatures, caution is advised for young children.